Opera introduced several changes in the most recent Opera Developer version 32.0.1899.0 including support for animated themes in the web browser. Animated themes are a controversial topic and it seems that users either like them or hate them but that there is little middle-ground when it comes to them. Opera's implementation adds themes to the browser's new tab page and the main change in Opera 32 is that animated themes can be installed in the browser now. The company has released a -- rather low res -- theme that is animated for Opera 32 that you can install if you run it. The theme that Opera Software released has a size of 6.8 Megabyte and is the only video theme currently available for the web browser. 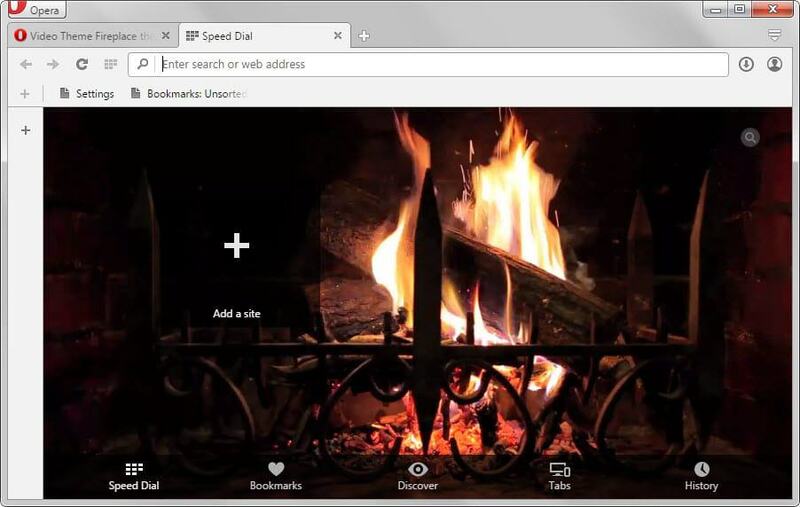 Once installed, it displays a video of a fireplace when you load the new tab page in the browser. The video has no sound and it is unclear if that is supported by the theme. It is likely however that sound is not supported as it would surely be distracting. I have created a short video of the video theme for Opera which you can play below if you are interested in seeing a live version of the theme and not only a screenshot of it. Opera Software notes that it has not yet optimized cpu usage when video themes are used in the browser so expect higher than usual cpu usage after installing animated themes in the browser. Opera has not published information that provide details on how animated themes are created for the browser. The feature itself reminds me of Dreamscene, animated desktop backgrounds, that Microsoft introduced in Windows Vista. In fact, Dreamscene was one of the few Vista Ultimate exclusive features. Opera users can use the internal update mechanics to update the browser to the latest version or download it from the Opera Desktop team blog directly where links for all supported operating systems are provided. This particular version of Opera introduces other features such as password syncing to the browser. I'd never use animated themes in a browser or the operating system as I find them too distracting. On top of that, they use more resources than regular themes or the default look and feel a browser ships with. Now You: What is your take on animated themes? Opera Software introduced support for video themes in version 32 of the web browser. So what animated themes do is impose a looped video instead of a static background, which is displayed in Speed Dial, Bookmarks, Discover and pretty much every other page. Frankly this is IMO nonsense, literally. It’s not because you’re wealthy that you’ll buy anything at any price (on the contrary) : same for the CPU, even with a powerful one what is the point in using the processor for nothing? Because an animated theme is nothing, no point, the alpha stage of madness. This is fundamentally stupid. IMO of course. Or it’s a low-level gadget, which resumes to the same opinion. I completely agree, but you’d be surprised how many “noob” types will eat this sort of thing up. I work on PC’s, and I often see people using the gawdiest, most visually offensive themes in their browsers (and on their desktops). That said, I wouldn’t think Opera’s user-base would fall into the ‘noob’ category. To me, this seems like a waste of programming resources and budget. I agree with you, also concerning the Opera community, anyway as far as I remember as it was then, “aristocrats” in a certain way for the most talented of its members, amateurs of clean code and healthy minds :) (I do appreciate controled sickness once in a while but that’s another matter!) As often if not always a company has to communicate both with its community and with potentially new users. But one could assume that a company such as Opera wouldn’t invest in nonsense when its reputation is, could or should be the major incentive. The price may be loss of a reputation. I mean, the Mozilla syndrome in Opera’s place is demoralizing. Even more demoralizing if we assume this syndrome is a planetary trend : flashy stuff. Ahhhhhhhhh the kiddies will love this! I think this is a terrible idea and I’d never use it, but if the Opera folks received a lot of requests to add this feature, I guess it’s what the users want. *Did* they get requests for it? they should work on substance and not junk like this. Are they running short of ideas for development? Trash…. You may have something there with your video production. Maybe let that cool jazz Segway into Barry White and bam, “Hello” date night by the Fireplace, lol. There is no added value in such feature. Perhaps they should concentrate on continuing to bring back the features they deleted back in the transition to V15? Animated themes was a concept tweaked from Russian Browser YANdeX (ALPHA). nothing new in it. It looks good but add more M.B’s to the .EXE file.